Last night I met with clients who had just moved in to their new home. Literally, they’d moved in hours ago, and I ended up finalizing interior paint selections amidst moving boxes and hungry, excited, adorable children. Lucky for the little ones in this house, their parents were very open to letting the kids play a role in their wall colors. I’ve had many clients who “let” the kids pick a color, but when the child says “I want green!” what they hear is ” We’re going to go with this understated olive from the sophisticated historical palette, ok?” If you can bear it, sometimes it’s ok to let the kids go with what the kids want. After all, it’s my job to make sure we can make that neon yellow work, and work it will. Anyway, last night, we also ended up incorporating chalkboard paint into the kids’ rooms in restrained but still very fun ways – both near desks, and both only on portions of the wall. 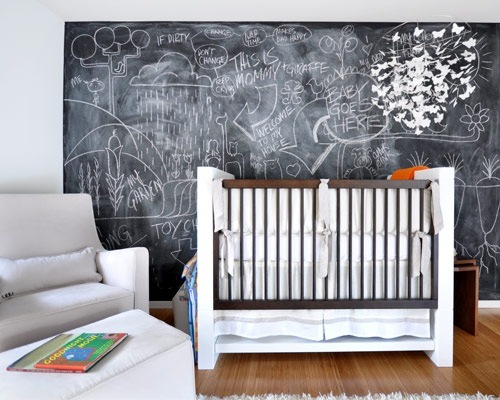 I love infusing kid’s spaces with novelty, and chalkboard paint is a great way to do it (you’ve heard me say this before). That said, chalkboard paint can come with some issues, so allow me to lay out some ground rules that will save you headaches should you choose to use it. Pay careful attention! – DO choose a small area to apply the paint to. There’s really no need to make every wall a charcoal colored art surface, so choose a small nook by the desk, tape off just a section, paint on the back of a door, or apply it under a chair rail. – DO monitor how your kid uses the wall for a while after you implement it. 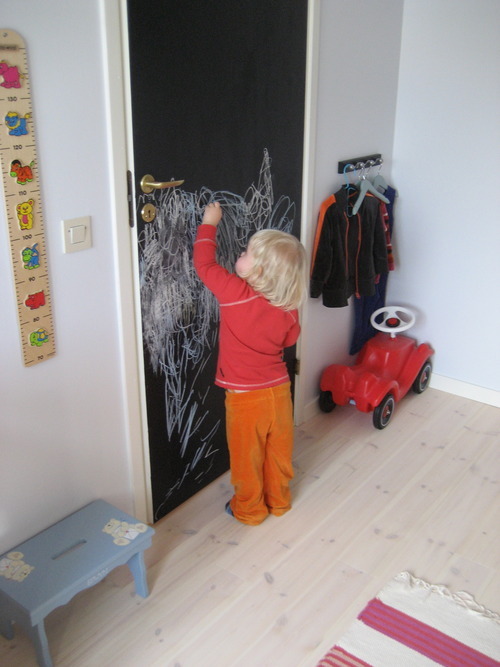 Start slowly by giving your kid one piece of chalk, or by storing the chalk in another room or a high place. To be super clear: don’t give your four year old a jumbo chalk bucket, lest you actually WANT to end up with six million broken stubs of chalk and marks all over surfaces that are painted with interior flat white. – DO place a play mat or cheap rug under the surface if you’re worried about dust. Truth be told though, if there’s chalk dust it will probably land on the molding (which is likely high-gloss, so just wipe it off regularly). – DO explore other uses for this fun surface. I used it in my own home on a wall behind the kitchen where the fuse box is located: it camouflages the ugly box AND the surface is magnetized, too! If you’re tired of chalk clean up, I recommend giving your child a teeny tiny cup of water and a paint brush to “paint” the wall. Monitor this activity so you don’t end up with a soppy mess. – DON’T use those chalk markers. They’re very hard to erase. 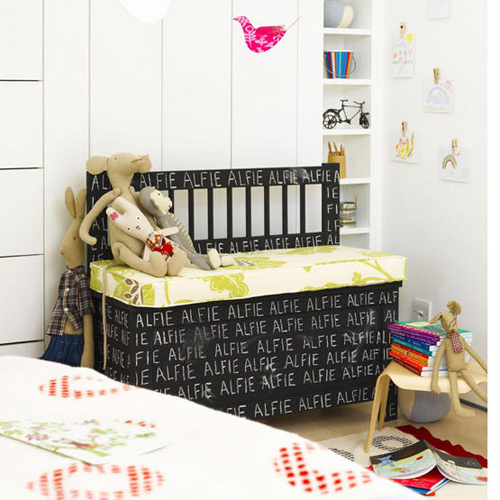 – DON’T paint above a crib, bed, or near an upholstered piece. Your bed/seat will just be a depository for colored powder. Young, mobile creatures have been known to reach out of the crib, touch the wall, and rub the powder all over themselves and their surroundings. And they eat it, too. – DON’T incorporate chalkboard into stripes unless they’re very wide (10” or greater). You’re just asking to mistakenly color outside of the lines. – DON’T freak out about erasing it! Use a lightly damp sponge or paper towels. Also, know that it’s not ever going to look perfectly clean. …and that’s part of the charm. 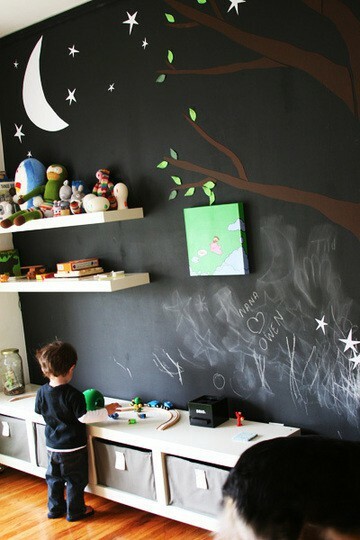 Do you have any other fun uses for chalkboard paint? If so, share in the comments! ← Books That Match Your Style. Love it! I painted the inside of one cupboard door to use as a To Do list area, which can be closed and easily hidden when guests come over. Doors are fun, too! Love it! Just found your blog, love it! 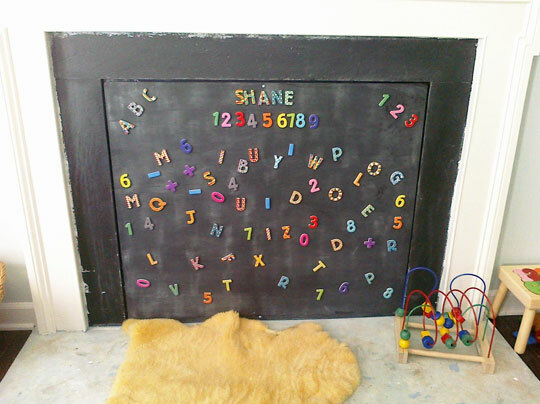 My favorite application of the chalkboard paint was to the back of the door – I love that, if anything happens (ie the kids are too rough), the door will come off and can be replaced easier than, say, a wall. But then again, this is the woman who’s afraid to nail a hole in the wall. Thank you so much – I’m glad you enjoy the blog!